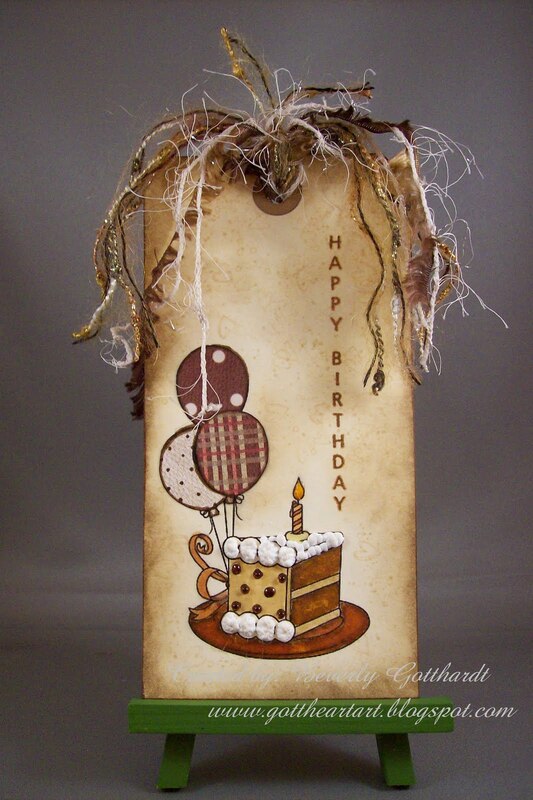 This Birthday Tag is for Tuesday Taggers, it's their 1st Blogerversary. These gals have really inspired me to create outside my box. Tags have never really been my thing, but I've learned some fun techniques and seen some wonderful creative talent on their blog. I know their 2nd Year will be even better than their 1st. If you haven't discovered them hop over for some fun. They've got a share going on and a free digi-you can see how great that is on my tag-and some other Birthday Surprises. Supplies: Lg. manilla tag, Papers: The Paper Studio-Mirabelle, Stamps: free digi from Terri at Tuesday Taggers, CTMH-C1257 Happy Birthday, Stampin Up-Sprinkles, Itty Backgrounds, Ink: Ranger Archival Ink-Coffee, VersaMark Ink Pad, Ranger Distress Ink-antique linen, frayed burlap, Stampin Up clear embossing powder, Liquid Applique-White, Ranger Glossy Accents, Fibers from $ Store, Stampin Up Blender Pen, CTMH markers. Oooh Yum! Thanks for joining us at TT this week! Hi Beverly - dropped by to catch up on your more recent blog posts. Love this tag - FABulous! Great cards - very much enjoyed my visit! Have a fun week. Cheers!